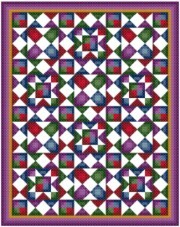 This cross stitch quilt pattern is stitched using beautiful jewel tone colors. A colorful delight for any stitcher. Download Only: $2.49 You will download the pattern. Nothing will be mailed, so you pay no printing or shipping charges. With Supplies: $21.24 You download the design. We will send you, 14 skeins of DMC Floss & Wichelt 14ct. 18" x 21" Aida (Ivory) to complete your project.